The modern workplace has been transformed by the rise in remote workers, causing a shift from permanent offices, cubicles, and dedicated meeting rooms to transient, multiuse work areas. 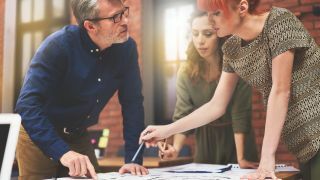 This trend, paired with the increased desire for collaboration by the millennial generation, results in reduced fixed office space and more huddle spaces, open floorplans, and flexible meeting areas. A byproduct of fewer workers reporting to the office is a decreased need for office space and less justification for dedicated conference rooms and complex AV installations. As a result, technology managers are being tasked with more closely managing the costs and justifying the investment and return on technology purchases. As needs change and less money is dedicated to permanent office space, there is a greater focus on equipment and solutions that can satisfy more requirements and provide greater value, yet offer consistency, reliability, and ease of operation. These shifts in needs present challenges for technology managers, AV service providers, and manufacturers alike; however, they offer new opportunities for ingenuity, creativity, and innovation for products and solutions. As organizations are doing more with less office space, technology has to support greater flexibility for multipurpose use, reconfiguration, and a variety of applications. Fixed installations of furniture and wiring are giving way to movable surfaces, wireless connectivity, and more centralized equipment. Additionally, with the adoption of software-based solutions for conferencing, collaboration, and control, paired with the increase in network-based audio and video transport and control communication, the demand for complex wiring and proprietary, single-purpose equipment is diminishing. To support this changing demand and maintain effectiveness, the AV industry needs to think differently, invest in understanding users’ and stakeholders’ needs and objectives, and adapt to the new way of working. AV systems are not what they used to be. In some respects, they are becoming simpler with less equipment, less wiring, and more basic operation. In other respects, they are becoming more complex with the need to support multiple applications, configurations, and user needs. Here are a few thoughts to consider when designing and planning for multipurpose AV spaces. One area that faces challenges resulting from flexible spaces is audio. Audio systems work best in fixed environments, where ideal microphones and speakers can be selected, placed, and tuned to support the design and acoustics of the space. When spaces are repurposed, the focus of the room changes and technology cannot be permanently installed around furniture; the result is that sound quality, intelligibility of microphones, and echo cancellation of conference calls suffer. One particular example is the use of ceiling microphones with ceiling speakers. Despite the flexibility ceiling microphones provide, they present challenges that require careful consideration in order to optimize performance. Leveraging the network for audio, video, and/or control signal transport to simplify installation and provide added flexibility provides great upside value. But it is also not without its own set of risks and responsibilities. As we move further away from our closed AV ecosystem and rely more on the client’s IT network, we forego control of our own destiny and the path to success becomes less clear. Working on the client network requires coordination, planning, and trusted relationships between the AV service provider, technology manager, and IT. This is especially true for high-bandwidth functions like video transport or control communication that are verbose or require specific security settings; requirements should be defined upfront and IT buy-in is a must. Additionally, the responsibility of commissioning and troubleshooting endpoints and configuring network switches requires proficiency that is not inherent in all AV service providers. The user experience stands to be the most challenged by the need to support multi-use spaces. Although sensors can be used to identify room configurations and control systems can support varied modes of operation, the ability to provide an optimal user experience is jeopardized by the requirement of flexibility and adaptability. When systems are sole-purposed, the ability to design and program a simple, straightforward, and easy-to-operate user interface is much easier than when provisions need to be included to support multiple applications, modes of operation, and likely varying types of users and needs. Typically, the tradeoff for flexibility is ease of use. Thus, it is important to understand that the best way to provide user-friendly operation is to manage system capabilities and requirements. It is easy to get caught in the lure of needing to accommodate any possible configuration or need from a single user interface. Despite the perceived value and security in knowing that the operation of the space can be truly maximized, the 80/20 rule can be a great reminder: 80 percent of the system use will likely come from 20 percent of its capability. Trying to support all of the possible needs and outcomes from a user operation standpoint will not only be detrimental to the user experience, it will also increase cost and likely have a negative impact on reliability. Ideally, user experience for a multipurpose space should provide the same comfort, simplicity, and ease of use as a single-purpose space. All hope is not lost in the effort to maximize capability while maintaining usability. A few ways it can be done is by designing purposed-based user interfaces that support subsets of capabilities and operation. Either by defining “presets” for typical user applications or supporting the ability for a technology manager or support staff to configure the user interface for a specific use on a case-by-case basis, the simplicity of the system operation and optimization of the user experience will be maintained. This concept can be carried out through the use of backend configuration tools programmed into the control system that allow the user interface and operation to be adjusted by a “user,” rather than requiring a programmer. As an industry, it is important to understand that we need to adapt to the changes in the workplace, so that we can continue to support the ways that our clients conduct their business. Understanding workflow is one important part. The other is getting to know the users better. We have to listen more closely to them and offer solutions that support the way they work and live, rather than trying to push them to adopt what we provide. The changing workplace is a reality, and it is important that the AV industry demonstrates humility by listening to requests, responding to needs, sharing expertise, and responding to the changes that are being presented. Although the needs are changing, AV professionals possess the experience and expertise to satisfy the new requirements and offer value as long as we recognize the need to work with users hand in hand. Steve Greenblatt, CTS, is president and founder of Control Concepts, a provider of specialized software and services for the audiovisual industry.